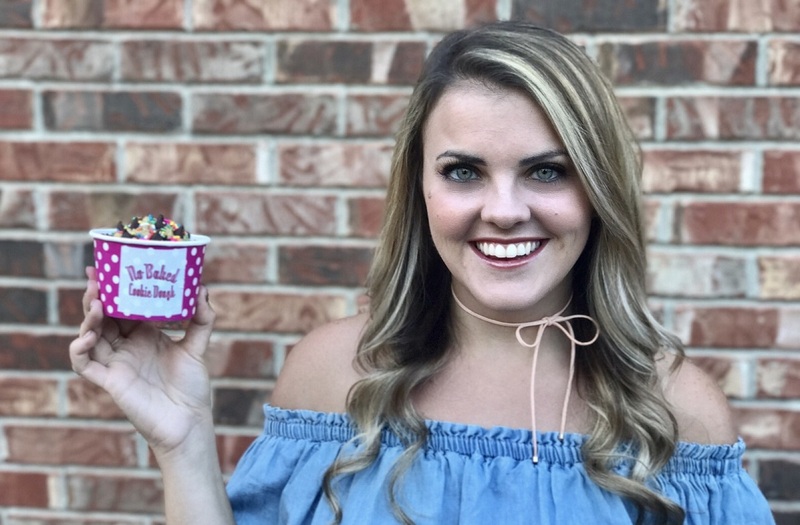 Nashville cookie dough sensation No Baked Cookie Dough, founded by alumna Megan Beaven (music business, 2015), opened its first brick and mortar location this week at 117 28 Ave. South, adjacent to Centennial Park. No Baked began setting up at pop-ups around the Nashville area in April of this year. Customers were able to keep up with No Baked’s locations through Instagram and Facebook, and cookie dough lovers around the city lined up for the trendy dessert while online orders came in from around the Southeast. After seeing success all year, the company made the decision to expand to a physical location that would embrace both residents and tourists alike. No Baked’s eggless cookie dough is made with heat treated flour and is safe to eat as served. Its staple flavors include Classic Chocolate Chip, Confetti Sugar, and Double Chocolate Chip. The new storefront–which offers additional flavors, toppings, coffee and other cookie dough desserts–was featured Monday on NewsChannel5.